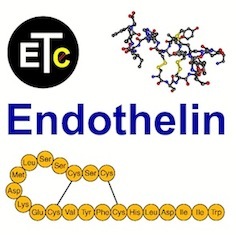 The Fourteenth International Conference on Endothelin (ET-14: September 2-5, 2015, Hyatt Regency Savannah Hotel, Savannah, GA, USA. Thurs., 8:00—10:00 AM, Ballroom A.
Ivana Vaneckova, Inst. of Physiology, Prague, Czech Rep.
Anthony Davenport, Univ. of Cambridge, UK. 1.1 New Insights in ET Receptor Pharmacology. 1.2 Identification of EDN1-AS: A Novel Long, Non-coding RNA in the Regulation of Endothelin1. 1.3 Autocrine Endothelin 1 Signaling Promotes Osteoblast Growth and Mineral Deposition Via Induction of miR 126-3p. 1.4 Novel UVR-induced Melanoma Mouse Model Based on Endothelin 3 Overexpression in Conjunction with Deficiency of the Nucleotide Excision Repair Pathway. 1.5 Endothelin A Receptor Drives Invadopodia Function and Cell Motility Through β-arrestin/PDZ-RhoGEF Pathway in Ovarian Carcinoma. 1.6 Early-life Stress Induces Epigenetic Reguation of the ET System in Adult Male Mice. Thurs., 10:30 AM—12:00 Noon, Ballroom A.
Ariela Benigni, Mario Negri Inst. for Pharmacological Res., Bergamo, Italy. John Pernow, Karolinska Inst., Stockholm, Sweden. 2.1 Inflammation, Immunity and Hypertension. 2.2 Macrophage Endothelin-B Receptors Clear Endothelin-1 & Regulate Blood Pressure. Neeraj Dhaun. Univ. of Edinburgh, UK. 2.3 Long-term High Salt Diet Delays Development of Proteinuria in Murine Systemic Lupus Erythematosus (SLE). 2.4 Role of the Myeloid Endothelin-B Receptor in Angiotensin II Mediated End-organ Damage. Odd numbered poster boards presenting. Friday: 1:00—2:30 PM, Even numbered poster boards presenting. Thurs., 2:30—4:00 PM, Ballroom A.
Rita Tostes, Univ. of Sao Paulo, Ribeirao Preto, Brazil. Donald Kohan, Univ. of Utah Hlth. Sci. Ctr. Jennifer Sullivan, Georgia Regents Univ. 4.2 Endothelin-1 (ET-1) Regulates the Expression of Matrix Metalloproteinases (MMPs) and Tissue Inhibitors of MMPs in Human First Trimester Trophoblasts via ETB Receptor: A Possible Role in Trophoblast Invasion. 4.3 Attenuation of Endothelin-1-induced Cardiomyocyte Hypertrophy Through Estrogen Pretreatment. 4.4 Endothelin-1: A Final Common Pathway Linking Placental Ischemia to Endothelial Dysfunction and Hypertension During Preeclampsia. Joey Granger, Univ. of Mississippi Med. Ctr. 4.5 Endothelin Receptor Type B (ETB) Deficiency Results in Greater Blood Pressure Levels During Pregnancy and in Response to Placental Ischemia-induced Hypertension in Rats. F. Spradley. Univ. of Mississippi Med. Ctr. Thurs., 4:30—5:30 PM, Ballroom A. 5.1 ET-1 in the Heart in Health and Disease. Noriaki Emoto, Kobe Univ., Japan. 5.2 Endothelin-1 Overexpression Exaggerates Type 1 Diabetes-induced Endothelial Dysfunction by Altering Oxidative Stress Balance. Mohammed Abdel-said, Georgia Regents Univ. Thurs., 5:30—7:00 PM, Ballroom A.
Kelly Hyndman, Univ. of Alabama at Birmingham. Joshua Speed, Univ. of Alabama at Birmingham. 6.1 Endothelial-Derived Endothelin-1 Contributes to Renal Dysfunction and Mortality in Sickle Cell Mice. 6.2 Endothelin-1 Increases Glomerular Permeability in Sickle Cell Mice. Malgorzata Kasztan, Univ. of Alabama at Birmingham. 6.3 Gender Comparison of Recovery from Intravenous and Inhalational Anaesthetics Among Adult Patients in South-West Nigeria. 6.4 Evaluation of Endothelin A Receptor (ETA) Blockade on the Progression of Renal Injury in Various Models of Metabolic Disorders with Pre-existing Renal Disease. Kasi McPherson, Univ. of Mississippi Med. Ctr. 6.5 Renal Endothelin and Purinergic Systems Contribute to Sexual Dimorphism in Sodium Excretion. 6.6 The Role of Endothelin System in Renal Structure and Function During the Postnatal Development of the Rat Kidney. 6.7 TUDCA Attenuates High Salt-Induced Renal Cortical Injury in ETB Receptor Deficient Rats by Decreasing Apoptosis. 6.8 ETA Receptor Blockade Improves the Differential Diurnal Natriuretic Response to an Acute Salt Load in Male and Female ETB Deficient Rats. 6.9 Hypoglycemic Effect of the Methyl Chloride-Methanolic Extract of the Fresh Fruits of the Gongronema Latifolia in Normoglycemic and Alloxan-induced Diabetic Rats. 6.11 Treatment with DPPIV Inhibitor Linagliptin Reduces Plasma ET-1 and ET-1-induced Cerebrovascular Hyperreactivity in Diabetes. 6.12 Endothelins as Markers of Cardiovascular Protection in Adults with Isolated Deficiency of Growth Hormone (IDGH). 6.13 Endothelin 3 Regulates Pigment Production and Coat Color in Mice. Fri., 8:00—10:00 AM, Ballroom A.
Matthias Barton, Univ. of Zurich, Switzerland. 7.1 Endothelin and Diabetic Complications. 7.2 Knockout of Endothelin-1 in Vascular Endothelial Cells Ameliorates Cardiac Mitochondria Dysfunction After Myocardial Infarction in Diabetes Type 2 Mice. 7.3 The Role of Endothelin in the Regulation of Blood Pressure in Early Diabetes Mellitus. 7.4 The Endothelin System Mediates Renal Endoplasmic Reticulum Stress Development. 7.5 p66 Shc Regulates ET-1-mediated Intracellular Calcium Handling in Renal Resistance Arteries and Contributes to Renal Glomerular Injury in Hypertension. 7.6 Renal Vascular Regeneration by Angiotensin II Antagonism is Due to Abrogation of ET- 1/ETAR Signaling. Fri., 10:30 AM—12:00 Noon, Ballroom A.
Anna Bagnato, Inst. Natl. Tumori Regina Elena- IFO, Rome, Italy. Marilena Loizidou, Univ. Coll., London, UK. 8.1 ET and Anti-angiogenic Therapy. Anton H. van den Meiracker, Erasmus MC, Rotterdam, The Netherlands. 8.2 Endothelin-1 Stimulates Endothelial-derived Microparticle Release. 8.3 Endothelin Receptor Signaling and Age Related Deregulation of Cerebral Artery Myogenic Tone. 8.4 High Dietary Fat Intake is Associated with Enhanced Endothelin-1 Vasoconstrictor Tone. Even numbered poster boards presenting. Fri., 2:30—4:00 PM, Ballroom A.
Yasuo Matsumura, Osaka Univ. Pharma. Sci., Japan. David M. Pollock, Univ. of Alabama at Birmingham. 9.1 Endothelin Antagonism as a Therapeutic Strategy in Kidney Disease. Neeraj Dhaun, Univ. of Edinburgh, UK. 9.3 Regulation of Collecting Duct Endothelin-1 Production by Flow and Osmolality. 9.4 The Role of a Renal Aldosterone-Endothelin Feedback System in Total Na Balance and Mineralocorticoid Escape. 9.5 Circadian Regulation of Renal Endothelin- 1. Fri., 4:30—6:00 PM, Ballroom A.
Martine Clozel, Actelion Pharma., Ltd., Allschwil, Switzerland. Pedro D'Orleans-Juste, Univ. of Sherbrooke, Canada. 10.1 Chronic Hypoxia in Endothelin-1 Transgenic (ETTG) Mice Generates Moderate Pulmonary Hypertension, Not Severe Pulmonary Hypertension and Its Plexiform Lesions. 10.2 Postnatal Ece1 Ablation Causes Severe, Progressive Pulmonary Disease. 10.3 The Evaluation of Endothelin Receptor Antagonist for Pulmonary Hypertension with Lung Disease. Sat., 8:00—10:00 AM, Ballroom A.
Constantino Iadecola, Weill Cornell Med. Coll. Janet Maguire, Univ. of Cambridge, UK. 11.1 Mechanisms of ET in Pain. Wolfgang Liedtke, Duke Univ. Med. Ctr. 11.2 Differential Role of ETA and ETB Receptors in CNS Parameters. 11.3 Significant Contribution of the Mast Cell-derived Chymase, mMCP-4, in Early Phases of Multiple Sclerosis in Mice. 11.4 The Endothelin System in Amyotrophic Lateral Sclerosis (ALS). Lyle Ostrow, Johns Hopkins Univ. Sch. of Med. 11.5 Central Endogenous Endothelins (ETs) are Involved in the DOCA-Salt Hypertension. Interactions Between ETs Receptor A (ETA) Blockade and Tyrosine Hydroxylase (TH) in the Anterior (AH) and Posterior Hypothalamus (PH). Maria Guil, Univ. of Buenos Aires, Argentina. 11.6 Endothelin B Receptor Agonist, IRL-1620, Provides Neuroprotection and Enhances Angiogenesis in Diabetic Rats with Cerebral Ischemia. Sat., 10:30 AM—12:00 Noon, Ballroom A.
David Webb, Univ. of Edinburgh, UK. Adviye Ergul, Georgia Regents Univ. 12.1 ET-1 and Neurovascular Coupling. 12.2 Relationship of Endothelin-1 and NLRP3 Activation in HT22 Hippocampal Cells: Relevance to Cognitive Decline in Diabetes. Rebecca Ward, Georgia Regents Univ. 12.3 Endothelin 3 Regulates Pigment Production and Coat Color in Mice. 12.4 Endothelin Receptor Antagonism in Sickle Cell Nephropathy. 12.5 ETA Receptor Blockade Inhibits Leukocyte Activation and Adhesion in Sickle Cell Disease. D. Gutsaeva, Georgia Regents Univ. SYMPOSIA XI: ENDOTHELIN THERAPEUTICS- WHERE ARE WE? Sat., 1:30—3:00 PM, Ballroom A.
Jennifer S. Pollock, Univ. of Alabama at Birmingham. 13.1 Endothelin Therapeutics in Cancer - Where Are We? Anna Bagnato, Inst. Natl. Tumori Regina Elena-IFO, Rome, Italy. 13.2 Endothelin Antagonists in Diabetic Nephropathy. 13.3 Endothelin Antagonism, Where Next? Pierre-Louis Tharaux, INSERM, Paris, France. 13.4 Review of Clinical Development of Sparsentan, a Dual-acting Angiotensin and Endothelin Receptor Antagonist. Radko Komers, Retrophin, Inc., Cambridge, MA. 13.5 Endothelin Research and Drug Discovery. Sat., 3:30—4:30 PM, Ballroom A.
Anthony Davenport, Univ.of Cambridge, UK. David Webb, Univ. of Edinburgh, UK. Masashi Yanagisawa, Univ. of Tsukuba, Japan.